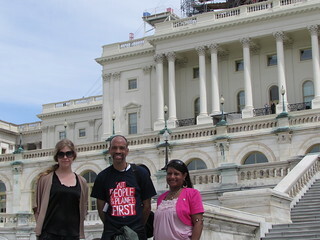 KFTC members attend the Populism 2015 conference in Washington, D.C. The Northern Kentucky chapter of Kentuckians For The Commonwealth held a forum on March 15th raising awareness about the challenges facing former felons upon returning to their community. Member Rick Traud opened the event by welcoming the 40 people who attended, and talking about his personal expreience dealing with former felons trapped in a cycle of poverty as the result of mistakes in their past while working as a volunteer with Saint Vincent De Paul in Northern Kentucky. The Saturday following I Love Mountains Day, the Northern Kentucky chapter celebrated their own love for the mountains with Northern Kentucky Loves Mountains. Aimed at raising awareness about issues that impact Kentuckians from the Appalachian region, this event focused on the devastation of mountaintop removal and the need to re-imagine the possibilities in eastern Kentucky. Just as no two regions of Kentucky are identical neither are KFTC chapters’ voter empowerment work. Across Kentucky KFTC members prepared to get out the vote during the primary election with activities including registering voters, tabling events, canvassing door-to-door and phone banking. Chapters were very creative about how they encouraged voters to exercise their voice in our democracy. The Jefferson County chapter organized an amazing Bike the Vote event that brought out a fun, diverse crowd. The chapter also canvassed the Smoketown neighborhood to talk to residents about housing and development issues while also encouraging them to vote.